This is an abdomen that has a minimal degree of redundancy along with localized fat accumulation (adiposity). 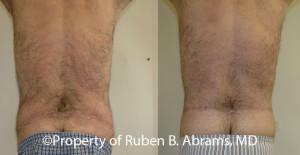 Often times this type of redundancy can be treated with SUCTION ASSISTED LIPOPLASTY / LIPOSUCTION alone. There is some disagreement amongst authorities as to whether this falls into the categorical classification of abdominal redundancy. However, in our opinion, it is best to classify it along with other types of abdominal redundancy and to consider liposuction or suction assisted lipoplasty of the abdomen a form of tummy tuck. The procedure is done through small 3-4 mm incisions that are placed in inconspicuous areas of the abdomen and they usually heal with invisible scars. Abdominoplasty or tummy tuck involves removing the excess skin and fat from the stomach and tightening of the abdominal wall. Sometimes, no amount of exercising or weight control regime will give you that flat and well-toned abdomen. It is the last resort if all the other techniques fail. However, it is not a weight loss alternative. Women may develop SUI problems after a vaginal birth. They have uncontrollable leakage and bladder control problems that are brought by laughing, sneezing, or coughing. Extreme weight loss and multiple pregnancies cause the stomach muscles to be discontent. The procedure is ideal when exercise and diet fail. People with weak abdominal muscles have noticed improved posture after the surgery, thanks to tightened muscles that support the spine. A ventral hernia puts pressure on the skin and causes weakened abdominal muscles. A tummy tuck prevents future occurrences. The surgeon will use general or local anesthesia. The procedure takes hours depending on the procedure. The length and number of incisions depend on the specifics of the surgery. The surgeon will work to ensure the scars as less visible and easily hidden. The position of the naval may change to tighten the skin and give the stomach a natural appearance. The surgeon will tighten the sagging muscle mass and remove excess fat and skin. Once the surgery is complete, the surgeon will suture the skin in place. The wound will heal naturally over time. The doctor will advise on tips for speedy and healthy recovery. The procedure has become popular in the recent past. 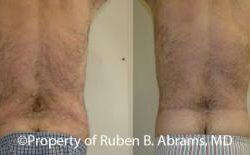 Despite appearing easy, it is a surgical procedure with potential benefits and for more info please consult with Dr. Abrams. 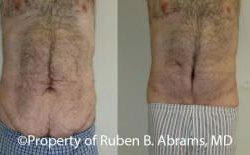 Dr. Ruben Abrams is a professional cosmetic surgeon in Los Angeles, Beverly Hills area who puts the needs of his patients’ first. Contact us today for the best medical attention! Note: Individual results may vary from patient to patient. This is an abdomen that has slightly more redundancy than type 1, mainly in the lower abdomen, along with some localized fat accumulation (adiposity), and none to minimal muscle laxity. This type of redundancy can be treated with a MINI TUMMY TUCK and LIPOSUCTION in necessary areas. For photos of different types of tummy tuck please visit the Tummy Tuck Photo Gallery Below. 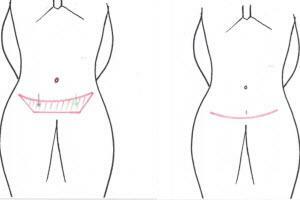 For more photos of different types of Tummy Tuck you may also visit the section on Mommy Makeover”. 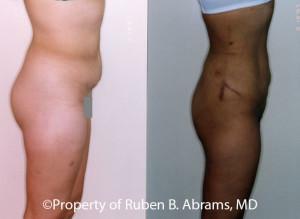 Patient with isolated Liposuction or in combination with other procedures. This type of redundancy is somewhere between a type 2 and type 4. 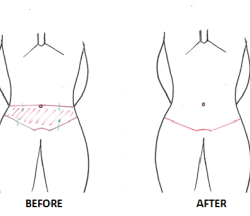 Meaning that the skin and fat has to be mobilized all the way to the chest wall and brought down, the muscles have to be tightened, and the belly button is transposed to a new location just as in a fully tumm tuck, but the redundancy is not enough to allow removal of all of the skin and fat between the belly button and the groins, as is done in a full tummy tuck. Therefore the old location of the belly button has to be sutured vertically, leaving a small vertical scar somewhere between the new belly button and the groins. 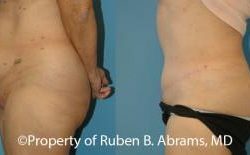 There are a very small percentage of individuals who have this specific type of redundancy and in our own series of nearly 2,000 tummy tucks, we have not had more than 5 patients in whom this type of tummy tuck had to be done. This type of tummy tuck is referred to as MODIFIED TUMMY TUCK. In the BEFORE drawing the shaded area indicates the skin and fat that will be removed. The green arrows indicate the direction that the remaining skin and fat will be pulled. In the AFTER drawing, the red line indicated the usual location and size of the resulting scar. Note the small vertical red line which is the location of the original belly button that was pulled down and sutured vertically. 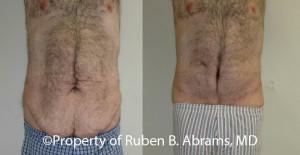 Patients with isolated Abdominoplasty (Tummy Tuck) or in combination with other procedures. Click on each photo to see different views. This is an abdomen with redundancy in the full surface of the lower abdomen between the belly button and the upper border of the mons pubis, but limited to the area between the two iliac crests which are the bony prominences of the hip bones that are felt just below the flanks. Along with this type of redundancy there is usually different degrees of localized fat accumulation (adiposity) in the flanks, iliac crest areas, and upper abdomen. There is also different degrees of laxity of the abdominal muscles, especially the abs. The treatment for this type of redundancy is a FULL TUMMY TUCK and LIPOSUCTION. 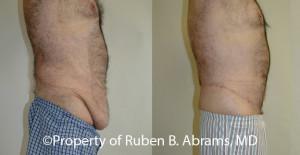 The photos below show an example of this type of abdominoplasty. For many more examples please visit our Tummy Tuck Photo Gallery. In the BEFORE drawing the shaded area indicates the skin and fat that will be removed. The green arrows indicate the direction that the remaining skin and fat will be pulled. In the AFTER drawing, the red line indicated the usual location and size of the resulting scar. In Type 5, the abdominal redundancy includes the area between the belly button and upper border of the mons pubis, but on the sides it extends beyond the iliac crests (the bony prominences of the hip bones that are felt below the flanks), and sometimes approaches the outer parts of the buttocks. It is usually associated with different degrees of localized fat accumulation (adiposity) in different areas, as well as different degrees of laxity of the abdominal muscles requiring treatment. This type of redundancy usually requires an EXTENDED TUMMY TUCK along with LIPOSUCTION as needed. 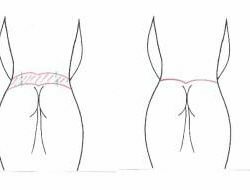 In our practice this is the most common form of abdominoplasty that is carried out. The sample photo below is an example. This type of redundancy refers to an abdomen which demonstrates sagging circumferentially, meaning all around the body, along with different degrees of laxity of the abdominal muscles and localized fat accumulation (adiposity). This type of redundancy is usually a result of MASSIVE WEIGHT LOSS secondary to BARIATRIC SURGERY. 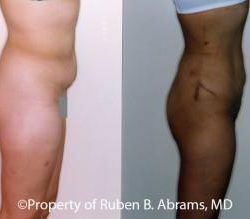 In order to obtain a satisfactory result with this type of redundancy a CIRCUMFERENTIAL BODY LIFT also known as TORSOPLASTY is required, along with LIPOSUCTION as necessary. 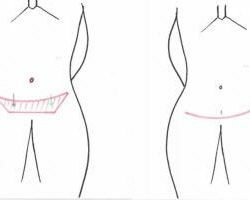 This type of Tummy Tuck is usually reserved for people who have had MWL (Massive Weight Loss) secondary to Bariatric Surgery. 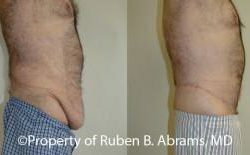 The following is an example of this type of Tummy Tuck / Body Lift. This is the most extensive type of abdominal redundancy, consisting of redundancy in the upper and lower abdomen, extending circumferentially to the buttock areas. This type of redundancy is also usually a result of MASSIVE WEIGHT LOSS secondary to BARIATRIC SURGERY. The appropriate treatment in this situation is a combination of a Fleur-de-Lis and circumferential body lift, known as CIRCUMFERENTIAL FLEUR-DE-LIS. The need for this extensive procedure is quite limited, and it is only carried out in post-MWL (Massive Weight Loss) patients. In the BEFORE drawing the shaded areas indicate the skin and fat that will be removed. The green arrows indicate the direction that the remaining skin and fat will be pulled. In the AFTER drawing, the red lines in the front and back indicate the usual location and size of the resulting scar. 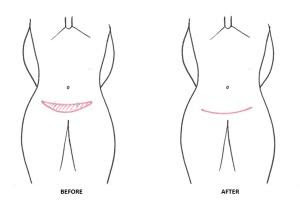 Note that in this procedure the skin is not only pulled down from above like the other types of tummy tuck, but it is also pulled up from below, hence the term BODY LIFT. Also note that similar to the Fleur-de-Lis procedure, the front scars consist of a vertical as well as a horizontal one. ©2019 NewAge Institute for Aesthetic Plastic Surgery - Do not copy. All rights reserved.